I don't know if I should classify this as gear testing or as new angle into a previous story. 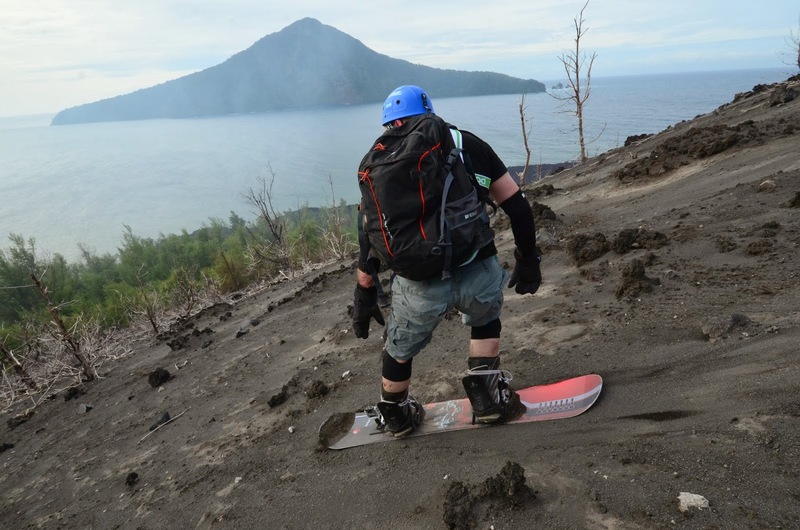 I have some new footage from my Krakatau trip, and it should give you an idea of what my snowboard went through. Yes, I bought it bought used. You'll also see what kind of treatment I gave to a brand new GoPro Hero 3 videocamera. It took the video that you see below. Amazingly, I still use the camera today. Although I occasionally keep having issues with the case; the locking mechanism is not working well. This could be due to the beating it has received. And I keep finding ash in my gear. If you are are wondering, the snowboard weathered the trip also amazingly well. The surface is full of scratches and dents, but there are no major holes. I could probably get it serviced back to a reasonable condition. The original Krakatau trip report is here. Beijing is big and congested. It felt like I had spent much of my week in a car, going from one meeting to another. And the same happened on my way to the ski area, as it took two hours one way. But it turned out that I was able to use the time: The previous night had been short. Traveling in Asia is tough, if you also need to spend the nights in phone conferences! The taxi ride gave me almost four hours of additional sleeping time. Surprisingly, my hotel had a sauna. Even more surprisingly, it was set up just right for the Finnish traveller. Eighty degrees and a big bowl of water to throw into the stove. Not bad! Of course, there was some silliness as well, like the sign on the door indicating that the sauna is not suitable for under sixteen years old. Oh well, this time I was not travelling with my family, so it was no problem. My hotel, the Doubletree, was a good choice for the Beijing traveller. It was not as expensive as the "proper" Hilton hotel, but in many ways it was at least as good. Recommended! I had been skiing before in Beijing, so now I was going to the Qiaobo's indoor ski hall for the second time. (The report from my earlier visit is here.) Qiaobo is behind the airport, far away from the city centre. And it is on an area that the local taxi drivers may not be able to navigate to. The map I printed from the net was useful, and the phone number for the ski centre was even more useful. You should not expect to find another taxi for the return trip, as the area is in the middle of nowhere. Fortunately, it is easy to convince the drivers to wait for you and get another long trip. When I had travelled two hours to the centre, skied for two hours, and made a return trip, my driver probably had done his day's work just on this trip. Qiaobo has two slopes, the beginner slope and the main slope. The beginner slope is small, simple and straight ski. The main slope is full of jumps, rails, and other fun constructs. Unfortunately, this time the upper part of the main slope was not in use. On my previous visit the upper part had a very nice bump run. But now both slopes were quite short. Oh well, I had fun anyway. Qiaobo has also a restaurant, meeting space and of course the rental shop. They also rent the clothes you need, naturally! Perhaps a little surprisingly, there were also ski equipment shops that seemed reasonably well stocked with gear. One day lift ticket cost less than 20 euros. Since we were in Beijing, I had to eat duck for dinner. The poor duck we ate was serial number 168206. As a part of the meal, I got a "commemorative" card for the duck. I ate this dinner in the Quanjude restaurant near the Beijing science park. The best after-dinner bar scene and other nightlife for tourists can be found from the Hou Hai lake area. I spent the evening in the relaxed The Zone bar and later in the Mix, a wilder nightclub. But I still think the best part of the evening entertainment was following the locals fishing on the Hou Hai. They used flashlights and fishing rods or spears in this nightly activity. It is, of course, illegal and completely unhealthy, and the lake is probably not very clean. But it looks great. Photos and videos (c) 2013 by Jari Arkko. Tämä blogi löytyy myös suomeksi.